I love #1! I'm a sucker for the color POP!! You do a great job! What kind of camera are you shooting with? #1 for sure for me...love the color of the wall behind. i like 3. i love antique vintagy photography. COLOR, COLOR! It feels like her facial features get lost in the other pictures. She is so beautiful! Great job! Being the Mom, I have to say I love them all! But the color is my favorite. Of course, I can be totally objective on this subject...ha! The colored on is the best because the blue really makes the photo pop! Love it! hmmmm. one AND three? is that allowed? #1 for sure! The blue and brown tones are fantastic together. If I had to choose between the b&w or the antique one though, I would choose the antique. It has a softer feel that fits her facial expression. 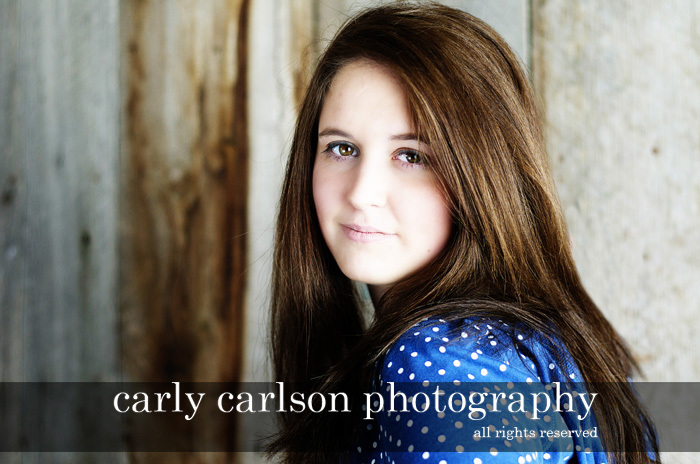 I LOVE what you're doing carly!! !